Item Code : Lc-bb-01 S.o. With enriched industrial knowledge, we have been able to offer a wide spectrum of Stylish Jewellery Box. 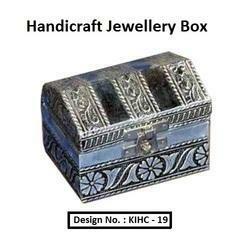 With the valuable assistance of skilled team of professionals, we are engaged in offering an extensive range of high-quality Handmade Wood Jewelry Box. - Material- Handmade paper covering, maroon velvet cushioning. 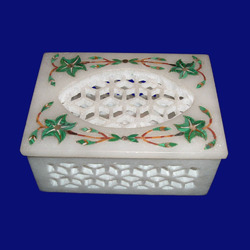 Conjure stylish storage in your home with our mesmerizing indigo and ivory Fantasy DECORative box. THIS IS PAPER JHIMKHI BOX FOR GOLD JHIMKHI RETAILERS & WHOLESELLERS. Store your accessories or jewellery in this beautiful hand crafted cane finish box. Driven with excellence, we are readily affianced in presenting Women Jewellery Box to our customers. Owing to our rich understanding and proficiency in this arena, we have been successful in presenting a premium quality of Doli Shape Handmade Jewellery Box to our respected clients.